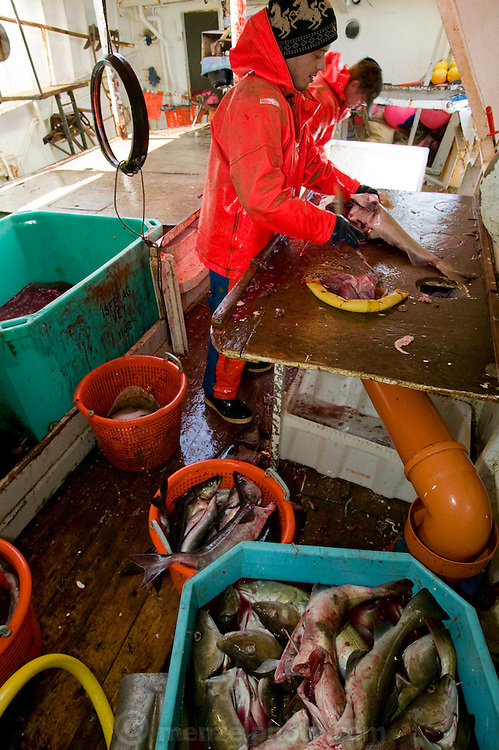 An Icelandic cod fisherman cleans fish in the belly of a boat near the small port of Sandgerdi on the western side of Reykjanes peninsula, Iceland. Although their craft is small, their large nets are mechanized. They monitor the casting then drink coffee and eat bread and fruit in the boat's galley until it's time to haul in the bounty. They clean the fish in the belly of the ship, toss the guts, and then, after repeating this cycle many times for 8 hours, head for port. The fishermen take a fish or two home each day, along with their pay.